When I was in college, one of my favorite foods to cook in the dorm* was microwave cupcakes. I can’t remember if they were Duncan Hines or Betty Crocker, but one or the other of them produced little kits for making four yellow cupcakes with chocolate frosting. It was a just-add-water deal, so perfect for kitchen-less living situation. They were not the best cupcakes ever, but as I’ve never been the girl who turns down a warm, fresh cupcake, I found them to be perfect. Sadly, these little gems disappeared at some point in the early 1990s, and near-instant cake vanished from my life. It was – not surprisingly – missed. It was not only the speed of microwave cupcakes I longed for, but also the small quantities. As someone who has lived alone most of my adult life, making a whole cake is a bit overmuch. 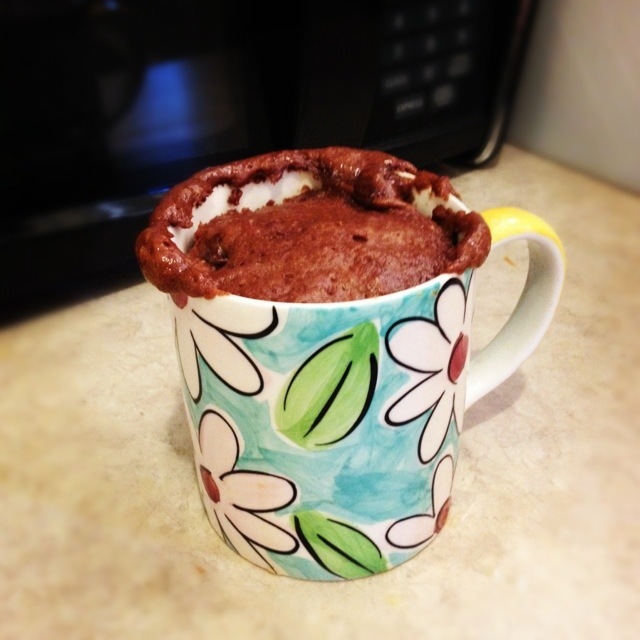 You can imagine my excitement, then, when Pinterest brought the concept of mug cakes to my attention. ** Somehow, the existence of these single-serving, ultra-fast scratch cakes had escaped me entirely. We can cry later about how sad it is that I’ve spent almost 20 years longing for something that already exists, but now is a time for celebration, for I made my first mug cake less than an hour ago and it was a success! My first-ever (but certainly not last) microwave mug cake. I made this recipe, and it turned out pretty well. If I did it again, I’d up the cocoa by at least a half-tablespoon or go with a more generous handful of chocolate chips – or perhaps both. (In other words: I wanted it to be more chocolate-y.) I also would probably use commercial peanut butter for a little extra sweetness, since my farmers’ market variety has less sugar. I’d also mix it in a lot less, in hopes of getting little pockets of hot, melted peanut butter in the finished cake. Overall, though, it was a fast, tasty treat – seriously five minutes from clicking on the recipe to being put into my mouth. Cake rarely gets more instant gratification than that. I can hardly wait to make more – and as luck would have it, there are lots of options! * That is, microwave cupcakes would have been my favorite had I known anyone willing to flout dorm rules and have a microwave. But of course, I did not. Of course. ** Also, when did salted caramel become such a thing? I never heard of it until about a year ago, and now it seems to be in every fancy recipe. Of course, I still haven’t figured out where to buy it. Also a recipe in this w/e’s WSJ. Glad you’re feeling better. If I make one, will my day get better???? Of course it’ll make your day better. That’s what cake is for! I love mug cakes. Do you know about crock pot chocolate cake? Too much for one, but it’s a treat at the office…smells delicious and is done in a few hours….I make that in my class once or twice a loop…. Whaaaat? You can make cake in a crock pot, too? And you’ve known this for some time? Why does no one ever tell me anything important? Susan, please email me that recipe? Oh, I missed this last night when I was craving desert!! Can’t wait to try it. And, Susan, you read my mind! Thanks for posting here so we all can share ;). I can just imagine this cooking in the teachers’ room or for a classroom afternoon snack!! So now we know how you get to be the Favorite Teacher !!! I thought we did flout the rules our senior year and had a microwave. I remember that because Joanne took out a package of popcorn and popped it in a microwave right in front of an RA (not from our building) and almost got us reported. Am I remembering that wrong? Nope, you’re right. It was my friend Alan, and he wouldn’t have reported us. My question is: WHEN DID WE EVER COOK CAKE IN THE DORM? You must have been hiding it from me. That is correct – I inherited my brother’s (also illegal) microwave* when he graduated from LeMoyne, so would have had it starting in my junior (your sophomore) year. And yes, I should have used the sarcasm font to make that clear. And I wasn’t holding out on you. I remember the cupcakes being omnipresent the year before – Chris, Kathy, Rachael and I used to eat them all the time. So maybe they ceased to exist in 1991? * That microwave – which made it through two college dorm experiences and at least my first two apartments – made its way back to my brother at some point and was just finally a couple of years ago. It was in service for 20+ years! Ah, I see the invisible facetious tags now. Silly internet. And no, there were never any illegal microwave cupcakes in our senior year suite. I feel cheated! NEVER in my life made a cake-for-one — and with measuring spoons yet!! The batter is yummy (sorry, had to taste it even with a raw egg) and will nuke shortly. Figured I should eat FOOD first :). Made choc frosting too! Will report …..
P.S. That microwave started here at home before it ever “went to college”. NOTHING lasts that long anymore !!! This is AWESOME!!! (“Baked/Nuked” in 1 minute!! incredible!!!). I could only eat half, which I’d also slathered in choc frosting. So, have another treat waiting for tomorrow :). WONDERFUL. THANKS, SARAH!! !